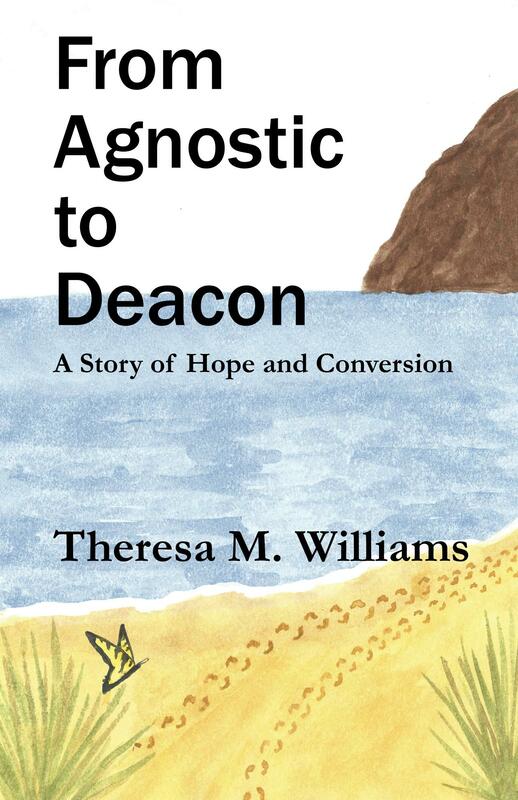 Bio: Theresa, a lifelong Catholic, has published articles in Deacon’s Digest, a national deacon’s magazine. She has written numerous articles for The Servant which is the newsletter of the permanent deacons in the Charlotte diocese. Her articles on work include A Man Named John, Compassion or Enabling, Letting Go for Something Better, Work – A Different Perspective, and My Patron Saint of Work. Theresa has written numerous others including A Christmas Reflection, Sabbath – Not Just for Sundays, and Jesus – God of the Ordinary? She has sung in the choir for over 20 years and is a catechist for aspiring Catholics coming into the Church. Theresa has assisted in her husband’s airport chaplaincy ministry since his ordination in 2006. She and her husband presented Marriage Encounter weekends for approximately five years and were in leadership for two years. Theresa is a native of South Dakota who met her husband Kevin while they were in the military serving as musicians. She lives in Charlotte, North Carolina, with her husband who is a Charlotte native, a permanent deacon, a certified spiritual director, and an airport chaplain. Thank you for sharing outstanding informations. site. It unveils how effectively you recognize this subject. Bookmarked this web site, will keep coming back for a lot more articles. thanks for spending some time to discuss this subject here on your blog. Yes, I’m okay with your sharing quotes from my posts as long as you provide credit and links back to my blog as well as leave the copyright notice. Glad you are enjoying! Cheers! the good work! I’ll go ahead as well as bookmark your site to return in the future. are meant to be shared around the web. Disgrace on the search engines for now not positioning this publish higher! It’s genuinely very complicated in this full of activity life to listen news on TV, thus I only use internet for that purpose, and take the latest information. to discuss. I look forward to reading many more great posts such as these. I’m actually glad to find this site on google, just what I was looking for. Thanks for writing this tremendous top quality articles. The information in this material shows my standpoint and you actually laid it out well. Continue the fantastic work , I read few blog posts on this site and I believe that your websiteis really interesting and has plenty of good info. You are more than welcome to share my blog with your Facebook group. Just keep in mind ‘site rules’ and giving credit. Glad you like it! Wonderful site. Plenty of helpful info here. I am sending it to several pals ans also sharing in delicious. And obviously, thank you for your sweat! You may email me at fromagnostictodeacon@hotmail.com.